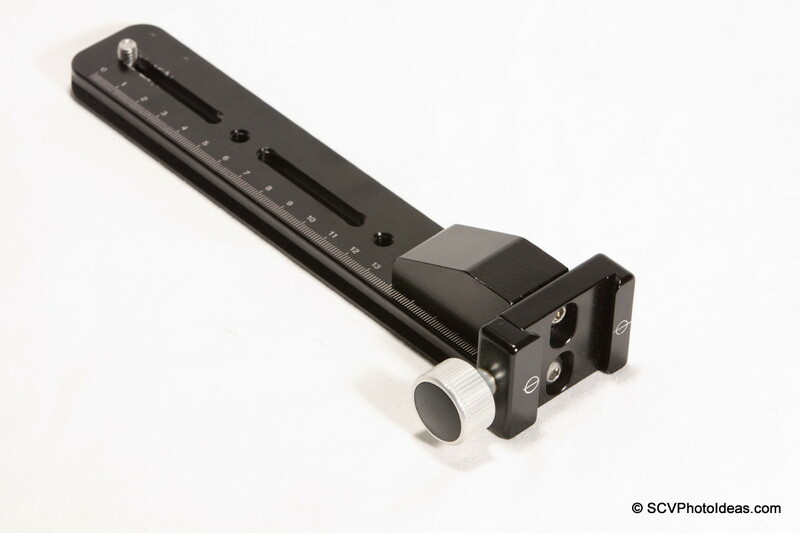 Almost a year ago, I had presented the construction from scratch of an Arca Swiss® compatible Multi Row Panorama Head in my article Create a Multi Row Panorama Head, with different parts from various manufacturers. The experience gathered during this time, brought up some new requirements. First, the fixed structure of the vertical rail made it difficult to accommodate in a bag and I'm not really fond of unscrewing and screwing on the spot taking care of alignment. Second, some limitations of my Economy Nodal/Macro Rail showed up, such as the need to unscrew the clamp in order to remove the index bar, or put a second one on. So, a few modifications had to be made, that would refine and make the Panorama Head more versatile. In the meantime my communication with Chris Hejnar of Hejnar Photo, had increased and as he is always open into developing new ideas we came up with a captive quick release clamp variation of his clamps. On the other hand he had also improved and refined his Macro / Nodal slide rails, and his general purpose rails. All the above added up in coming to a full Hejnar Photo solution for a Multi Row Panorama Head structure, except for the Panorama Clamp rotators... at least not yet. 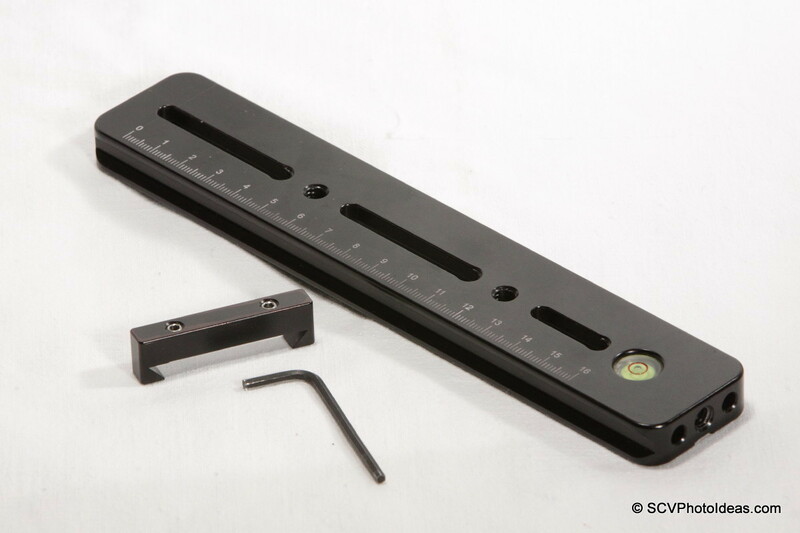 This set comprises of two 8 inch Rails one for vertical and one for horizontal use, a 6.5 inch Nodal slide Rail, two 1.5 inch Quick Release clamps, one 90 degree Block, two Index Bars, five 1/4"-20 captive screws, one 1/4"-20 flat head screw, five M3 screws, two dowel pins and a set of three Allen Hex keys for the 1/4", M3 and index bar screws respectively. The first group of components (A1) F69 Captive Quick Release Clamp, (A2) 90 degree Block, (A3) G10-80 8" Rail, together with (A4) a set of five (5) 1/4"-20 captive screws, assembled together will give a versatile, easily detachable vertical rail. 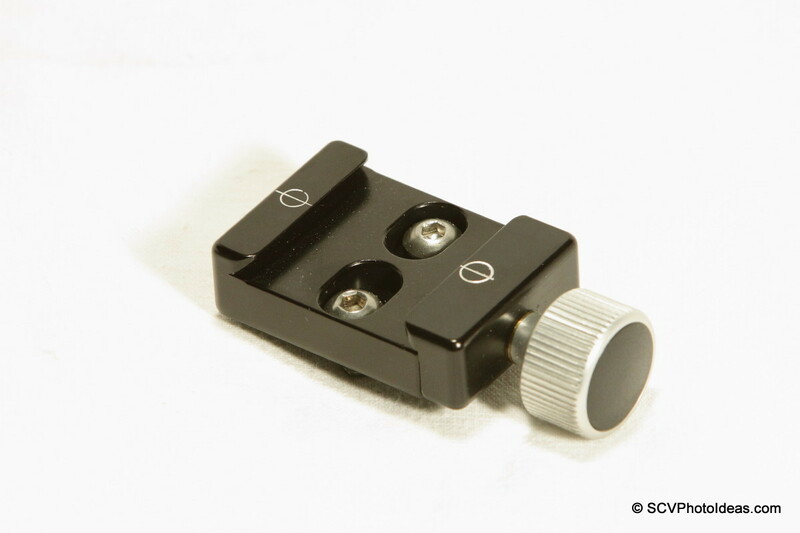 Hejnar Photo G010-80 8" Rail is 1/2" thick with three captive slots, two 1/4"-20 threaded holes between them and a front 1/4"-20 tapped hole. 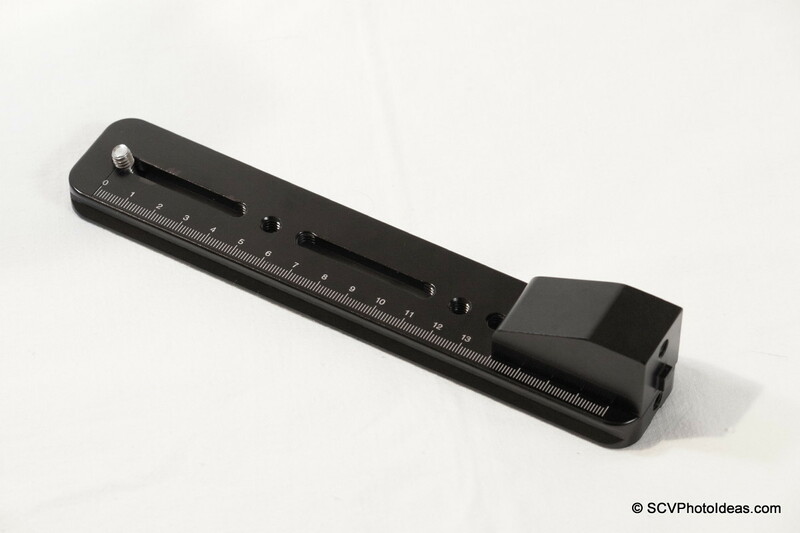 A laser engraved decimal scale from 0 to 18cm runs along one side on the top surface. Two 1/4"-20 captive screws, need to be inserted in the captive slot near the front hole (in this case will be the bottom hole) for the attachment of the G-103 90 degree block and one 1/4"-20 captive screw, needs to be inserted in the captive slot on the other end (or top in this case) for the attachment of the vertical rotator /panorama clamp. 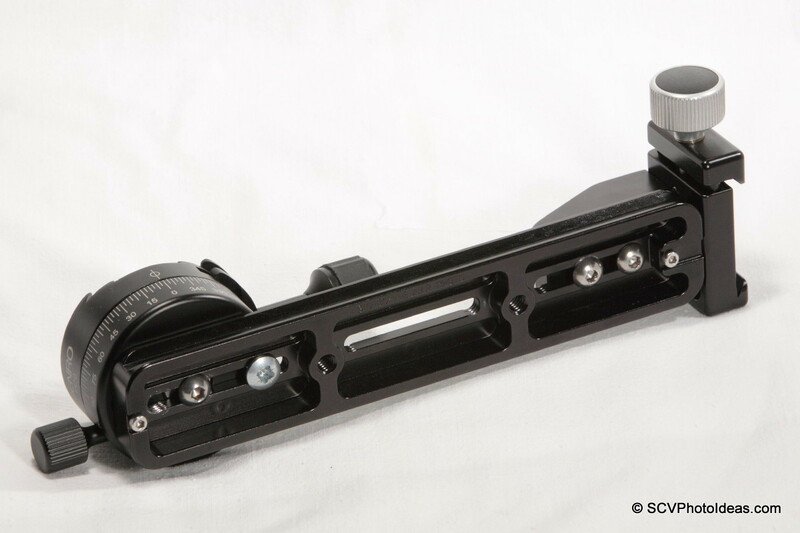 On the bottom side, the G010-80 rail has two cross bars which add anti-torsional strength to it and comes fitted with two M3 stop screws, one at each end, protecting from accidental drop off, from a non fully closed clamp. As this rail will be used in vertical position these stop screws are not actually needed but can stay there with no problem. 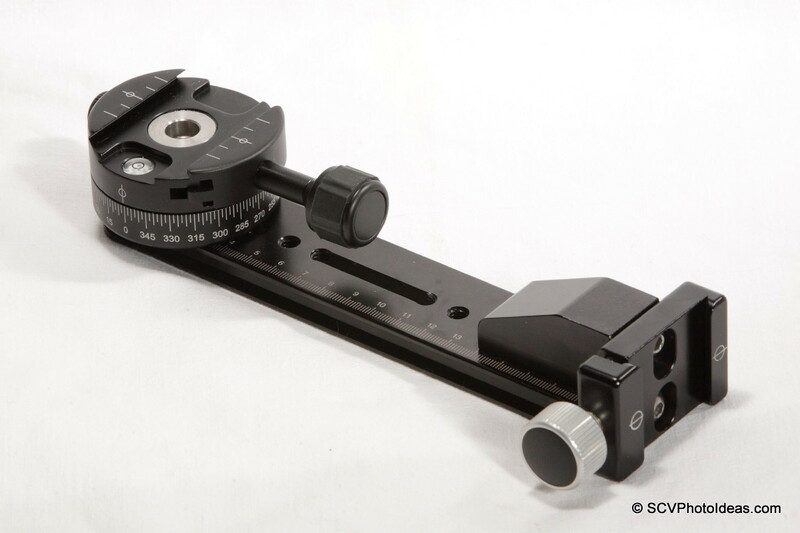 The Hejnar Photo G103 modified 90 degree bloc has two 1/4"-20 tapped holes on the vertical side and one 1/4" tapped hole on the horizontal (bottom) plain accompanied by an anti twist island. The dimensions and geometry of the block, except for vertical alignment are designed to give exceptional sturdiness to the whole structure, permitting the G10-80 rail to withstand greater load and torque than expected from a 1/2" rail, without any torsion or vibration. 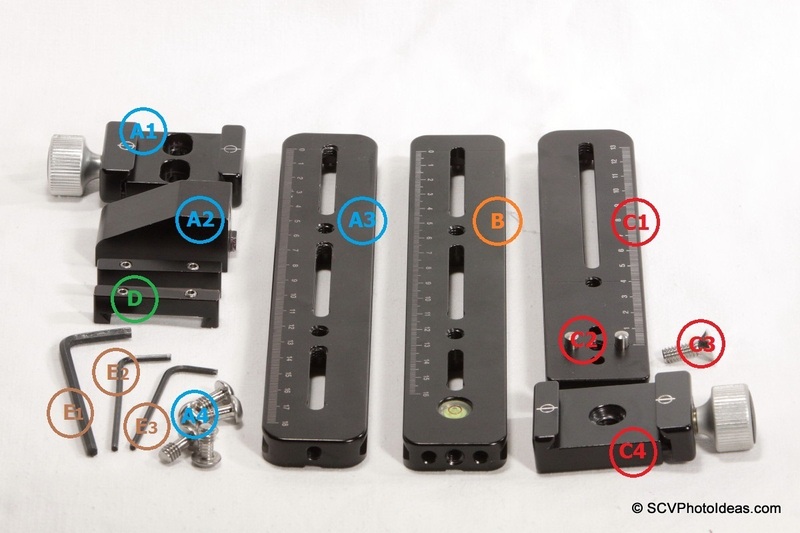 For better alignment the 90 degree block should be screwed on the rail first. 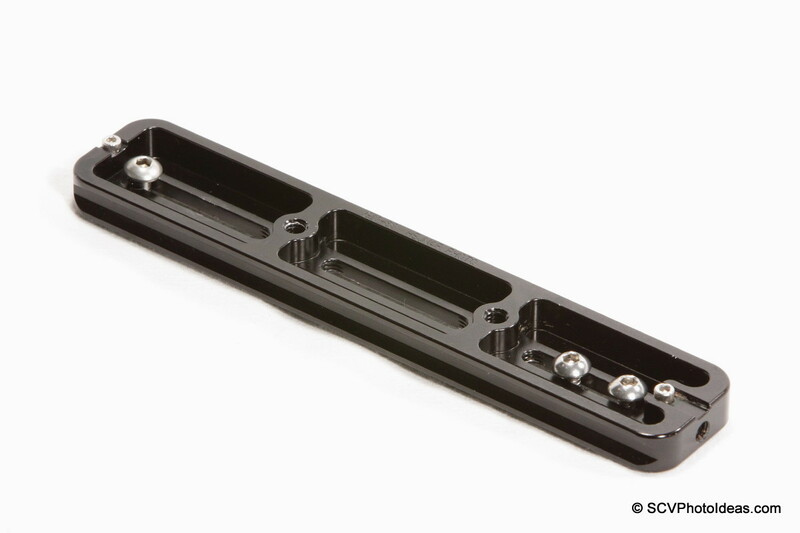 In order to fix the block with two screws on each side the block must be attached on the side of the Rail with the front 1/4"-20 tapped hole. At this point the screws should be fit but not fully tightened yet. Full view of the Hejnar Photo G10-80 rail with the G103 90° block attached. In order to attach the F69 clamp at the bottom of the vertical rail, we need two 1/4"-20 captive screws and the appropriate Allen hex key (E1). The two screw need to be inserted in the captive slots first. 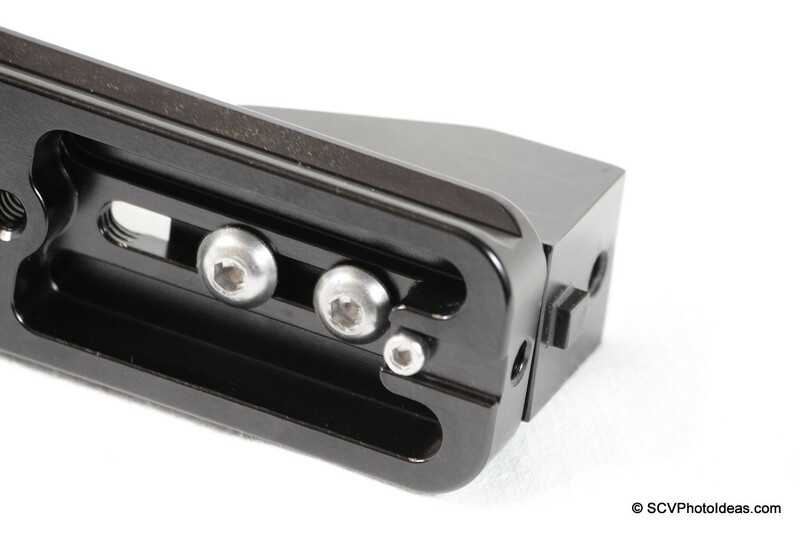 F69 clamp matches exactly the dimensions and the hole centers of the G10-80 + G103 combination. 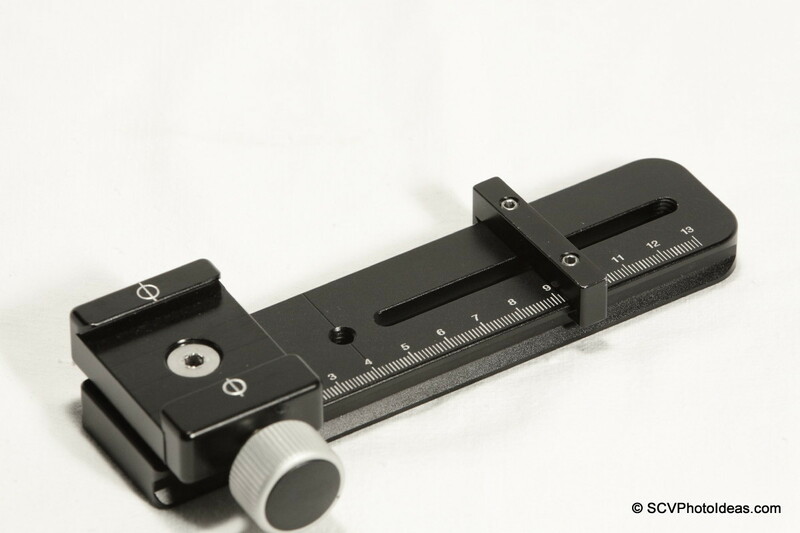 Laying the rail on a flat surface, the clamp can be aligned and screwed in position. Then the two 1/4"-20 captive screws holding the 90 degree block should be tightened fully. Now we have a very sturdy and versatile rail, that can be attached on or detached from the horizontal rail at will, but can also be moved on top of the horizontal rail. 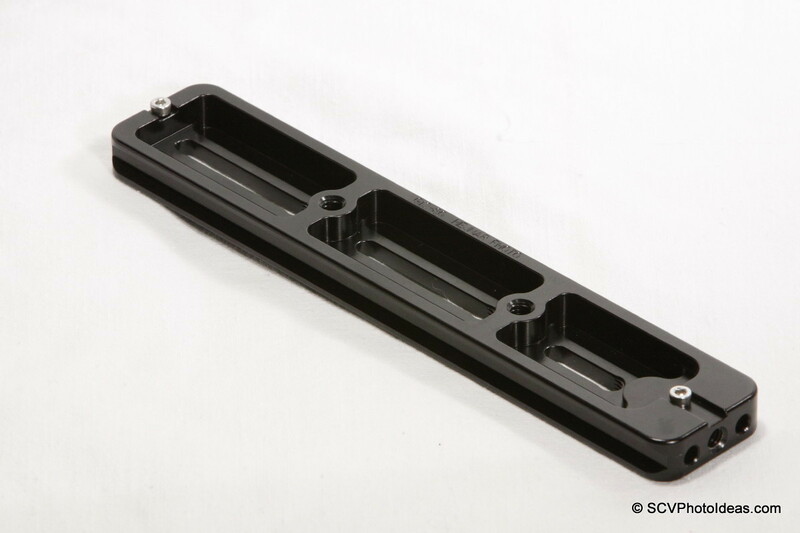 The next component (B) is the G13-80 Rail, which is the improved version of G10-80 rail described above. 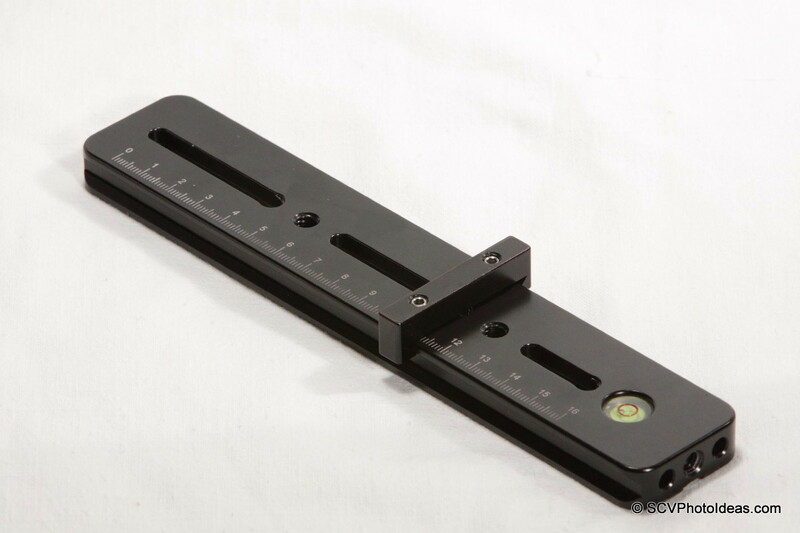 Due to its embedded Bubble spirit level is perfect for use as a horizontal rail. G13-80 is also 8" long by 1/2" thick, has three captive slots, two 1/4"-20 threaded holes between them and a front 1/4"-20 tapped hole. 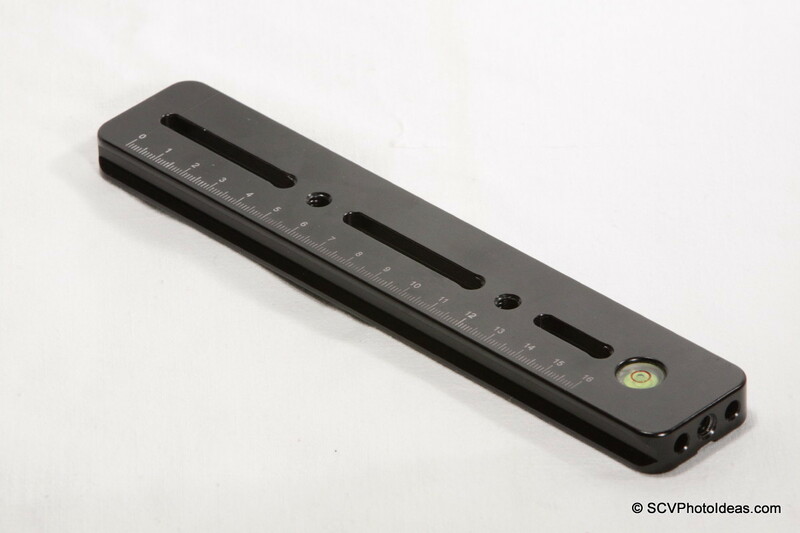 A laser engraved decimal scale from 0 to 15cm runs along one side on the top surface. 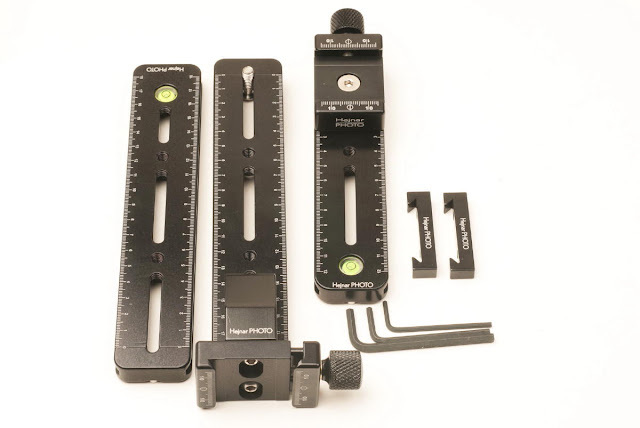 The major differences between the G10-80 and G13-80 are the addition of a 12mm bubble spirit level and of two dowel pin holes aside the front hole for alignment purposes. 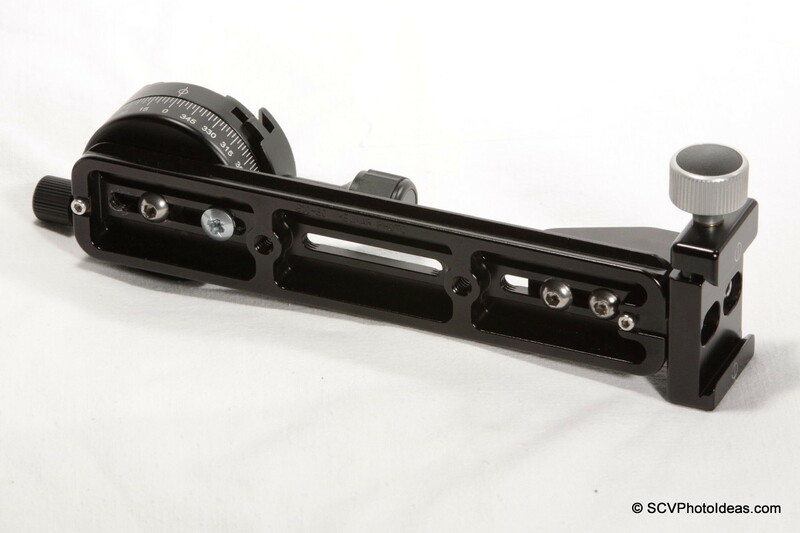 (For more details about the use of the front holes you may see my Ideas for a Long Lens Support Bracket). 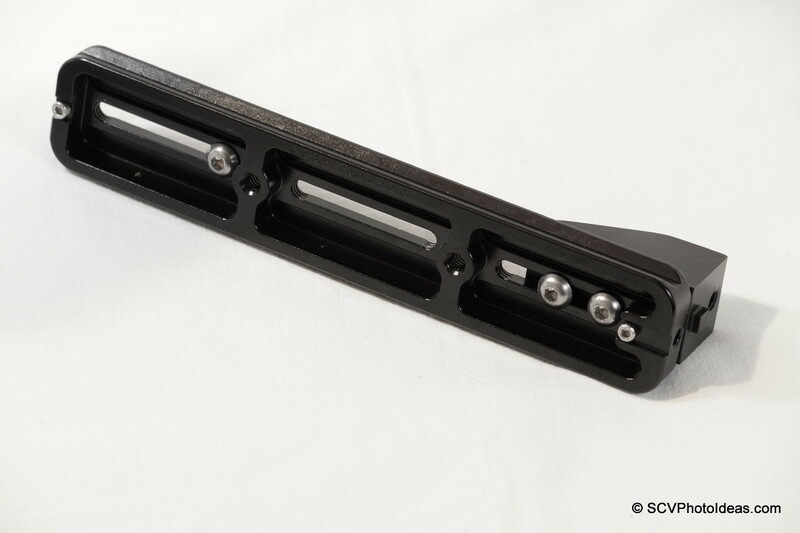 The bottom side of the G13-80 rail is almost identical with the G010-80 rail except for the shorter first captive slot in order to accommodate the bubble level. 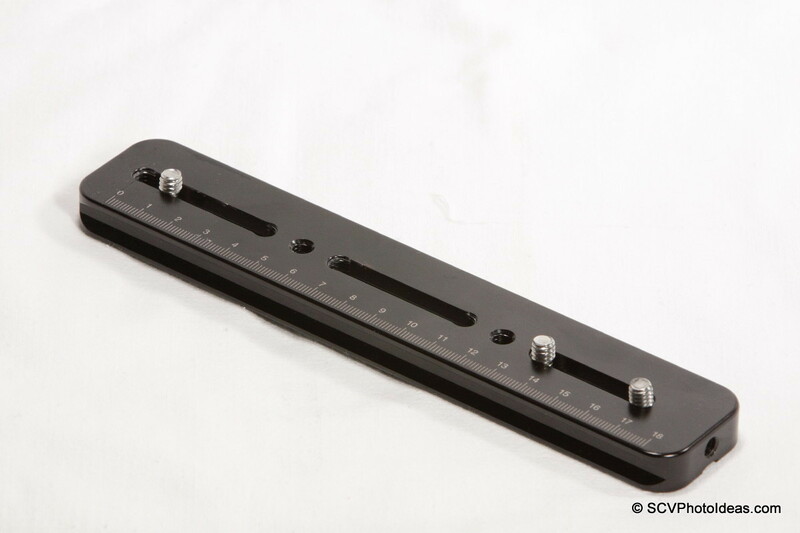 As all Hejnar rails is equipped with two M3 stop screws one at each end. 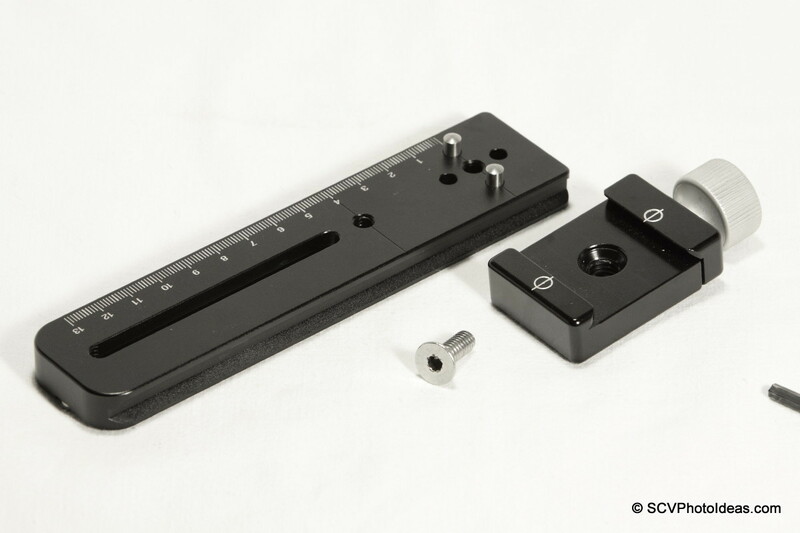 Components (C1) E31 Nodal / Macro slide rail, (C2) pair of dowel pins, (C3) 1/4"-20 Flat screw and (C4) F012 Quick Release clamp, assembled together will become a very sturdy and versatile Nodal slide, 6.5" long and 1/2" thick. A Nodal slide is necessary for determining the lens' entrance pupil (nodal point) at which it should be pivoted in order to avoid parallax error. 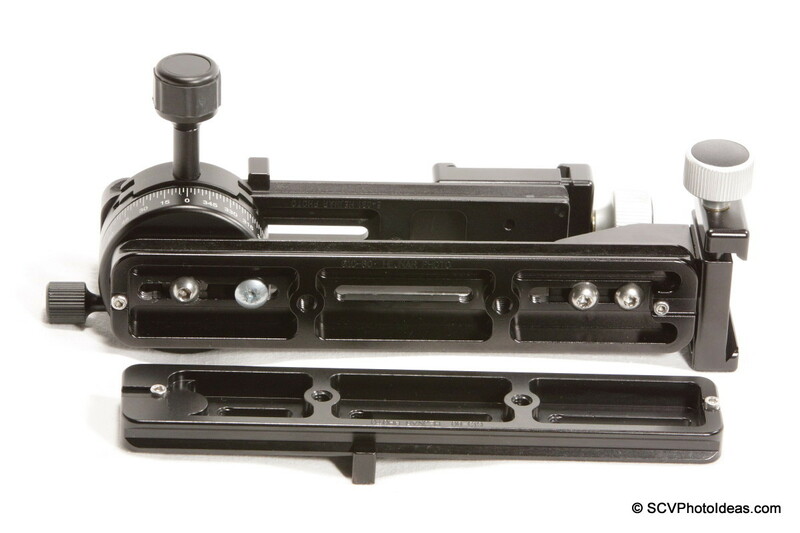 The 1/2" rail thickness adds a lot to the Panorama Head sturdiness and minimization of vibrations. Further, the laser engraved metric scale and the ability to relocate the quick release clamp make it more convenient to use with many camera/lens combinations. The two dowel pins fit on the side holes of the alignment groove at the bottom (or back side ) of the clamp. In this way the clamp will completely align with the rail and avoid any twist under any load. 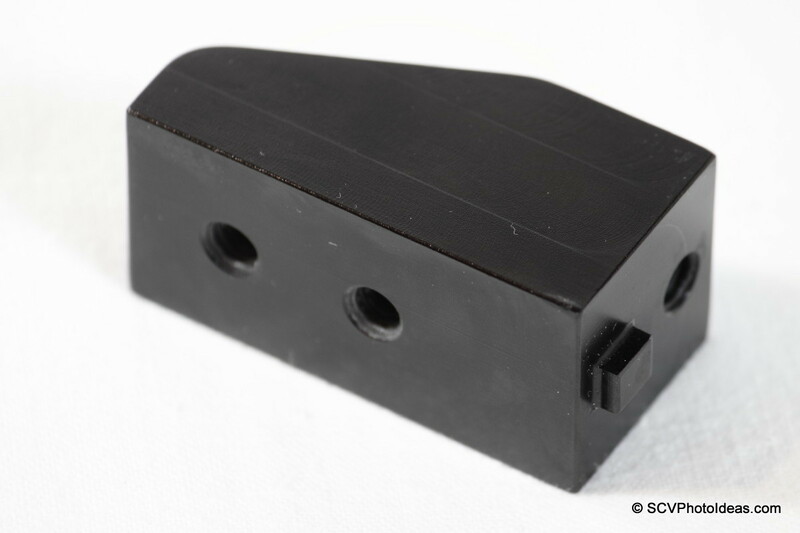 The F012 clamp is secured with the provided 1/4"-20 screw on the rail with the aid of the appropriate Allen Hex Key (E1). 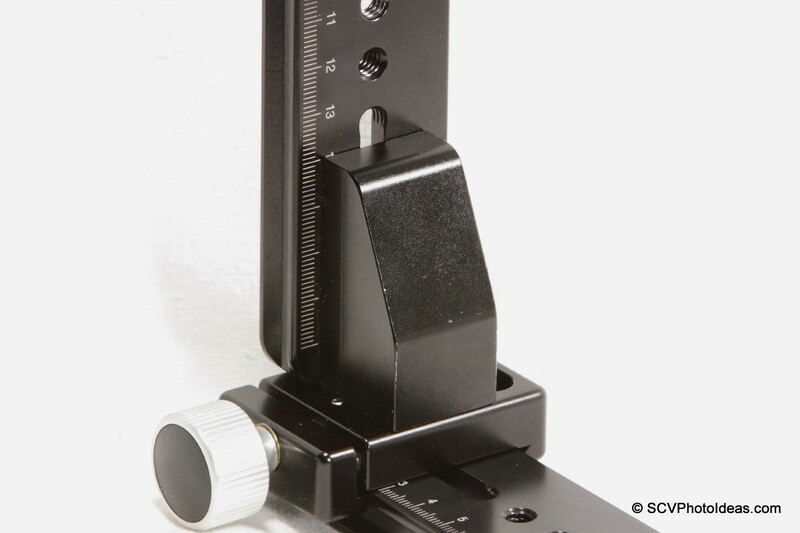 In my Hejnar Photo E31 Nodal/Macro Rail Review you may find full specification and details on the assembly of the nodal slide, as well as about the versatility it offers to mount the clamp in different angles to the rail. Set components (D) are the Hejnar Photo Index Bars which are equipped with two soft tipped screws. 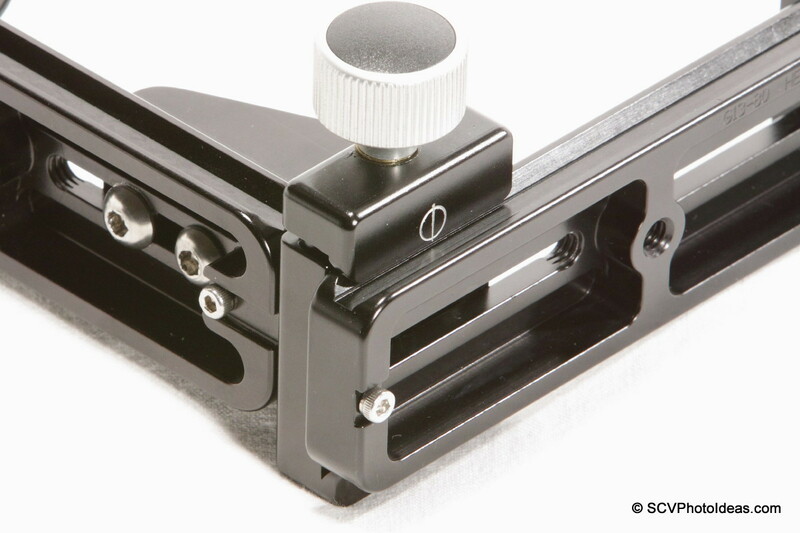 This proves a convenient solution, avoiding stickers, for marking on rails for the lens in use. A reference when dismantling the head for transport and reassembling on the spot. Each bar is very light and will only add 9 gr ( 0.3 oz) to the total weigh. 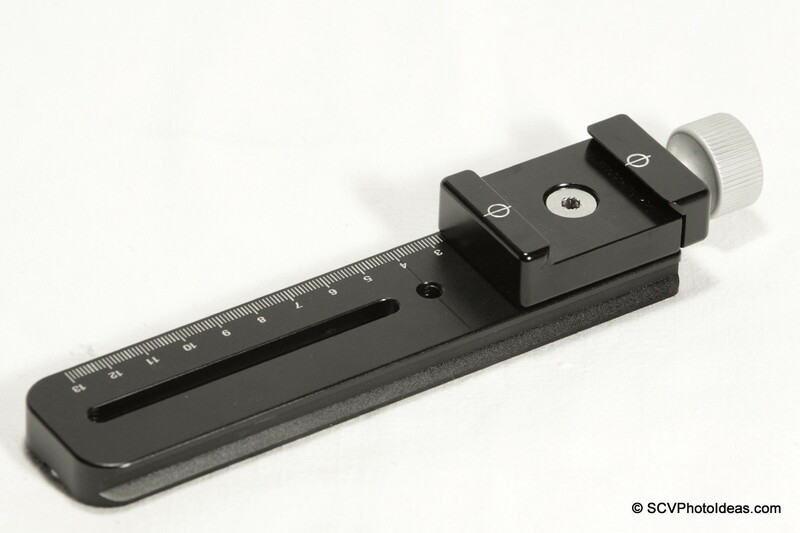 Each bar can be fixed at the desired position on the top dovetail of the rails with the appropriate Allen hex key (E3). 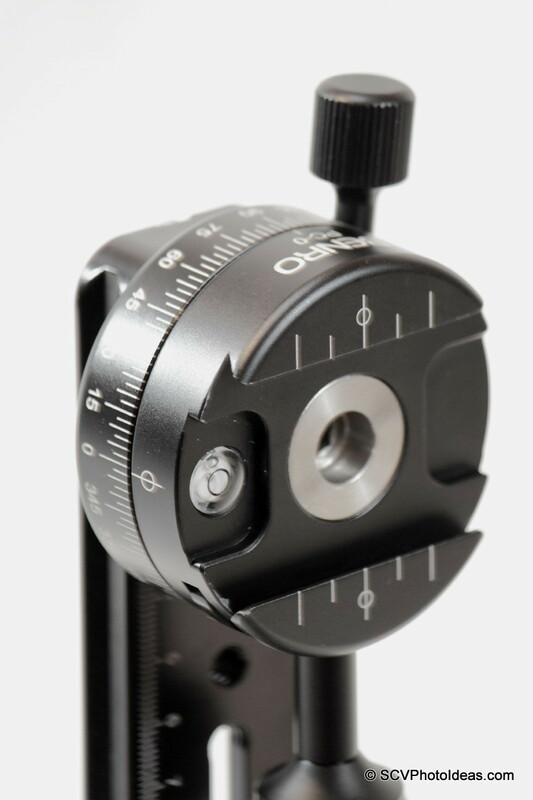 One Index Bar which in my opinion is necessary should go on the horizontal rail to mark the lens center so as it matches the panoramic head's pivoting point. Another Index Bar which I consider necessary should go on the nodal slide rail to mark the lens nodal point for easy future reference. 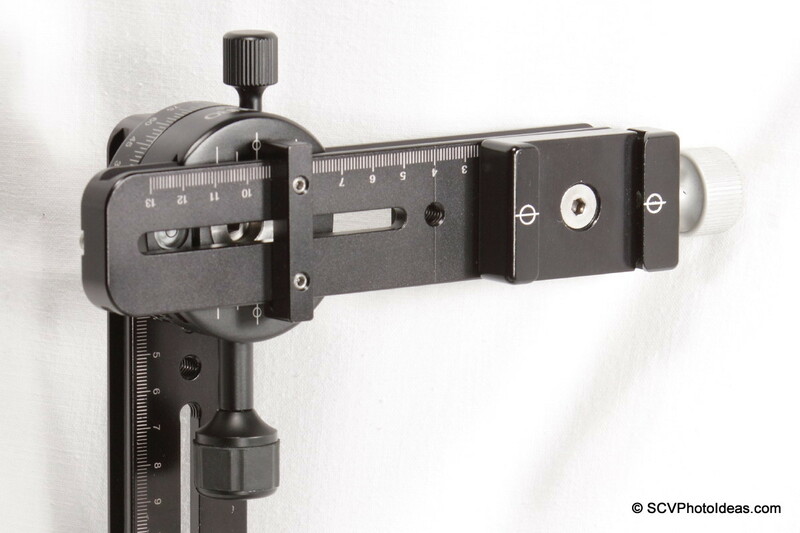 After the assembly of the vertical Panorama Rails and the preparation of the nodal slide, it is time to equip the Panorama Head with a vertical and a horizontal rotator. 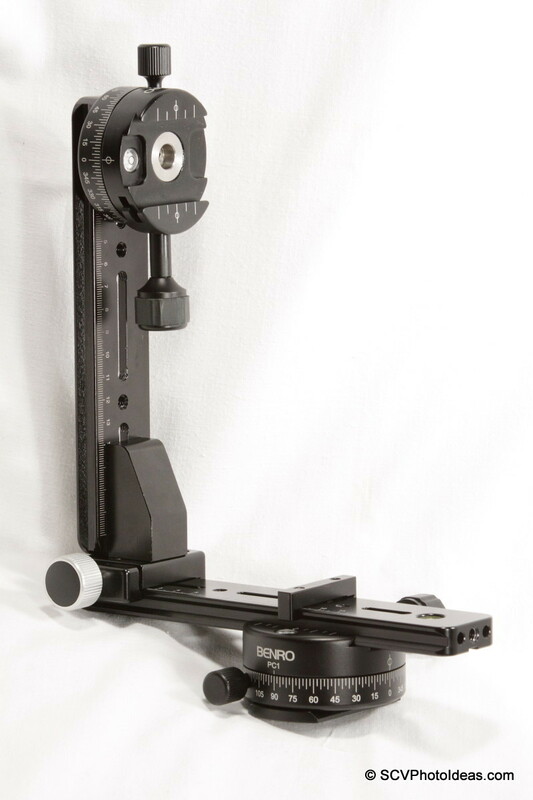 As in my previous Panorama Head version, the Benro PC-0 Panorama Clamp will be used as a vertical rotator and the Benro PC-1 Panorama Clamp as a horizontal rotator. 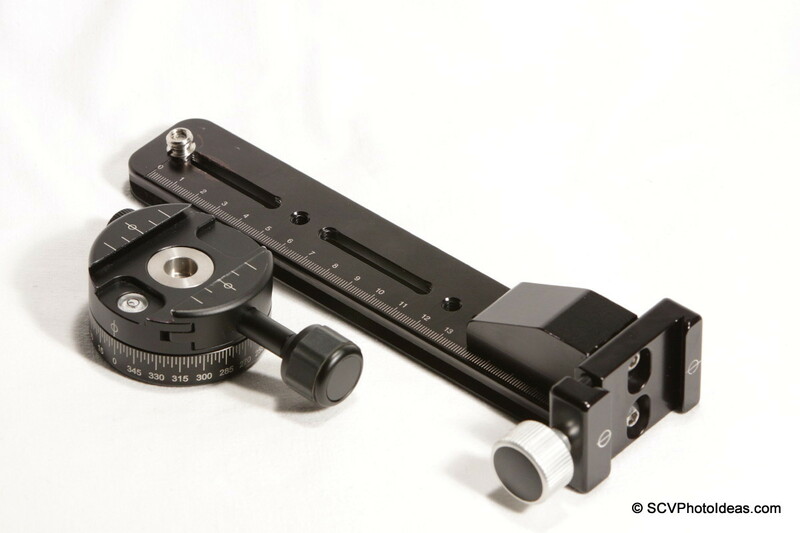 The exact position for attaching the Panorama clamp on the vertical rail has to be chosen according to the camera and lens combination to be used. 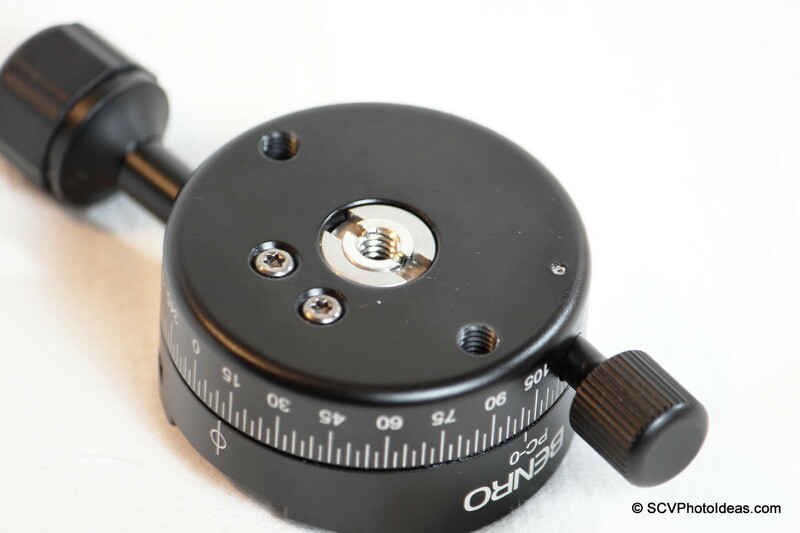 For better response to vibration the lower the better, keeping in mind to leave ample room for the nodal slide + clamp screw knob when it will turn vertical in order to shoot a zenith point. 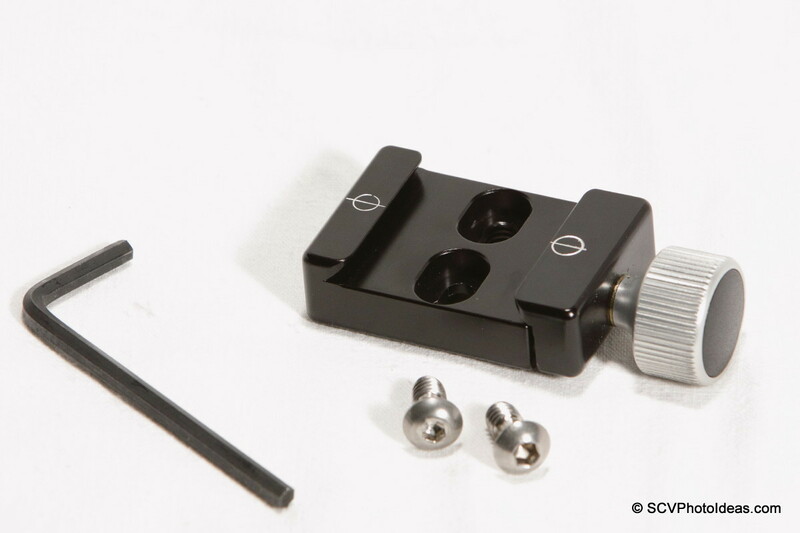 Since the bottom hole on the Benro PC-0 Panorama Clamp has a 3/8"-16 thread, an 1/4"-20 to 3/8"-16 converter bushing is needed in order to use the 1/4"-20 captive screw on the rail. 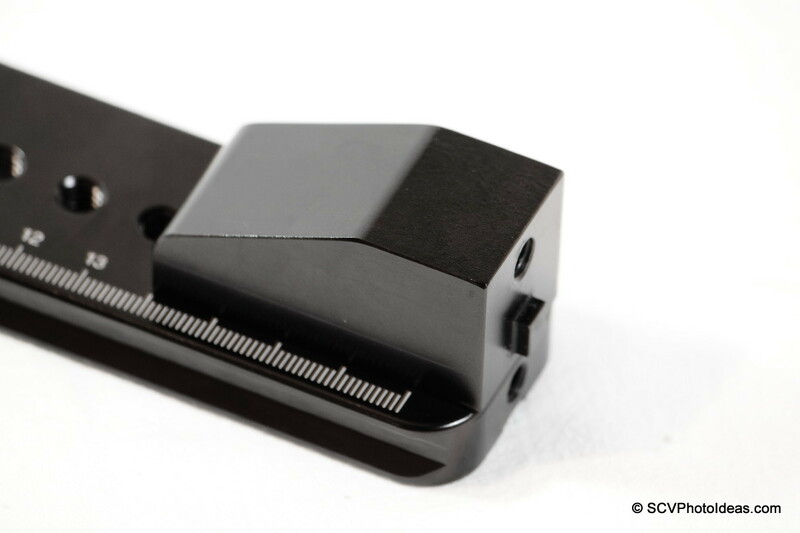 With the base dovetail plate removed from the Panorama clamp the converter is screwed and tightened with a big flat screw driver. 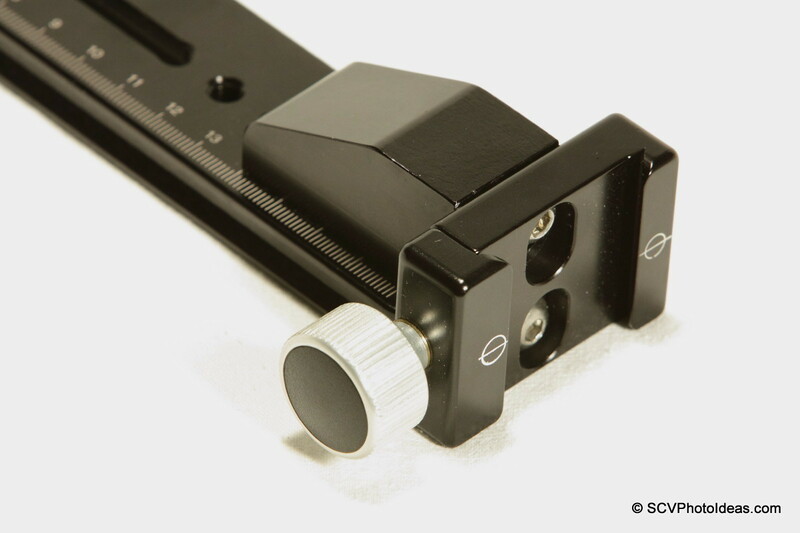 Then the PC-0 Panorama clamp can be screwed with one of the provided 1/4"-20 captive screws. 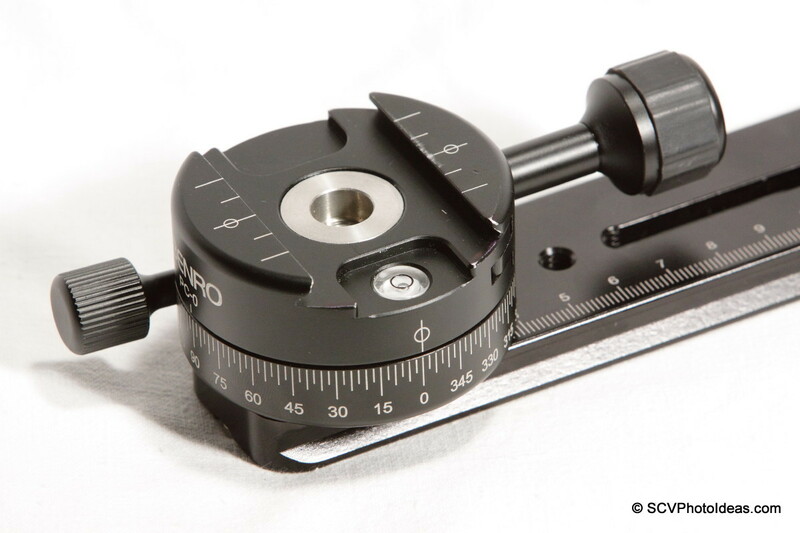 Care should be taken in the alignment of the Benro PC-0 Panorama clamp, so the Φ mark coincides with the zero (0) mark and the long clamp knob placed downwards so as not to interfere with camera handling during panorama shooting. 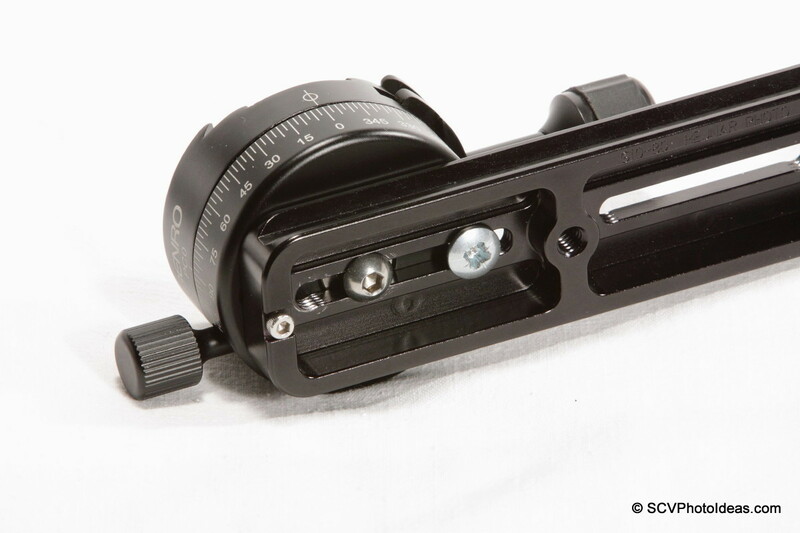 However, one more improvement is to add an M6 captive screw 1/2" long in one of the M6 threaded holes at the bottom of the Panorama clamp. 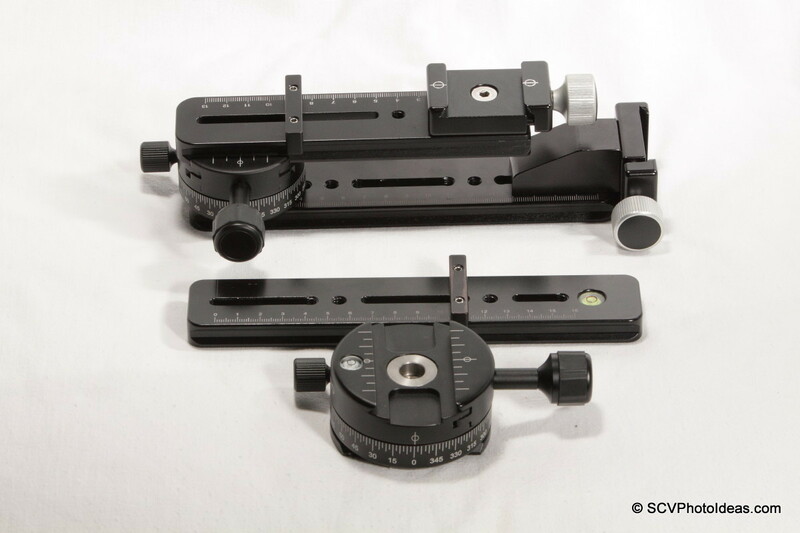 This will facilitate very much in alignment, prevent the Panorama clamp from twisting under heavy loads and increase the strength of the whole structure. Our Vertical Panorama rail is now ready! 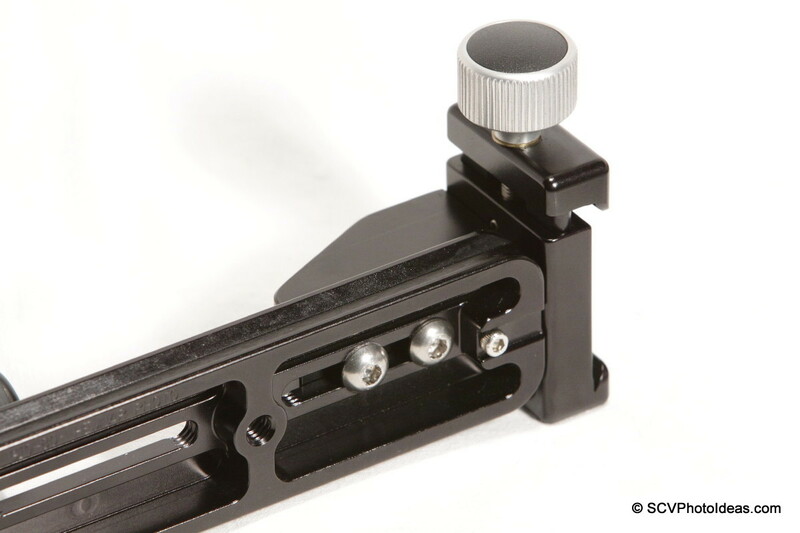 The next obvious step is to mount and clamp the horizontal rail on the PC-1 Panorama Clamp which will play the role of the horizontal panning base. 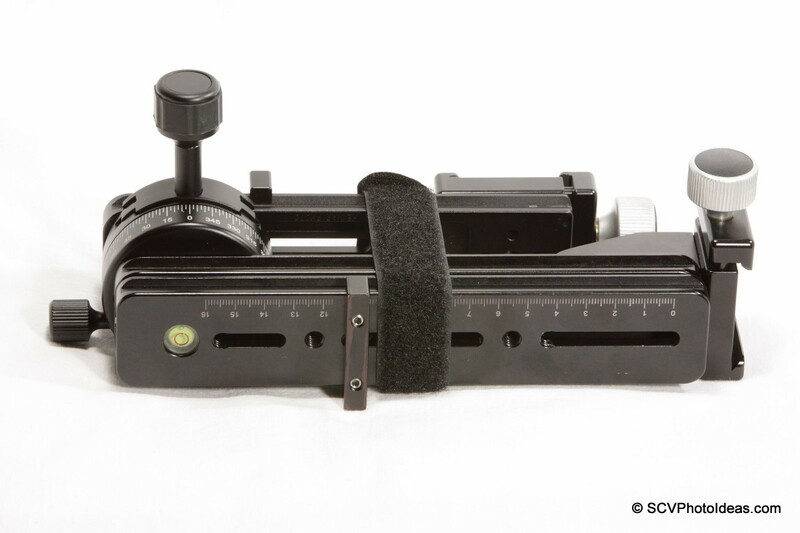 The rail should be inserted in the clamp and aligned to the predetermined index mark that corresponds to our camera/lens center. 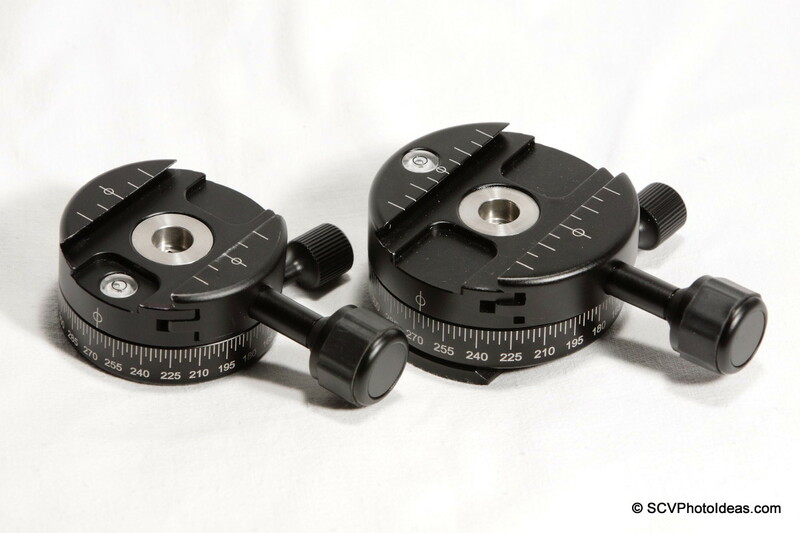 More details for determining the lens center you may find in my article about Using a Multi Row Panorama Head. It's easy then to slide or mount from top the vertical rail structure on the horizontal rail. From the bottom view you can see how the clamp fits on the top dovetail of the horizontal rail and is locked in place. Now the Panorama head structure is almost complete. Final part is to add the Nodal slide rail. Before attaching the Nodal slide rail, the panning brake lock knob (shown on the top of the picture) should be tightened, immobilizing the rotator. Next the Nodal slide is positioned and locked to the predetermined Nodal point by the index bar. The whole structure of the Multi Row Panorama Head is now ready! Total weigh 1,204 kg (2.65 lbs) ! Just 70gr (2.47oz) more than the previous version but with added sturdiness and versatility in operation. Needless to say, a lot more flexible and easier to transport. One of the main reasons that made me seek of improvement on the previews version of the Panorama head, was the ability to dismantle the head easily and have it safely packed for storage and/or transport. 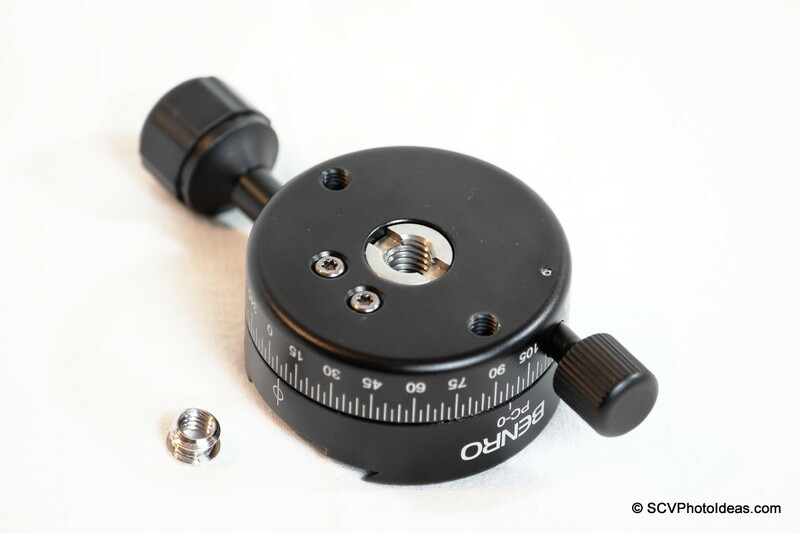 In this Version the Panorama head can easily be taken apart in three pieces. The Nodal slide rail can remain on the PC-0 Panorama clamp in its "lowest" position and turned in a parallel position to the Vertical rail. ... the rails can be attached and fixed together with a Velcro strap. 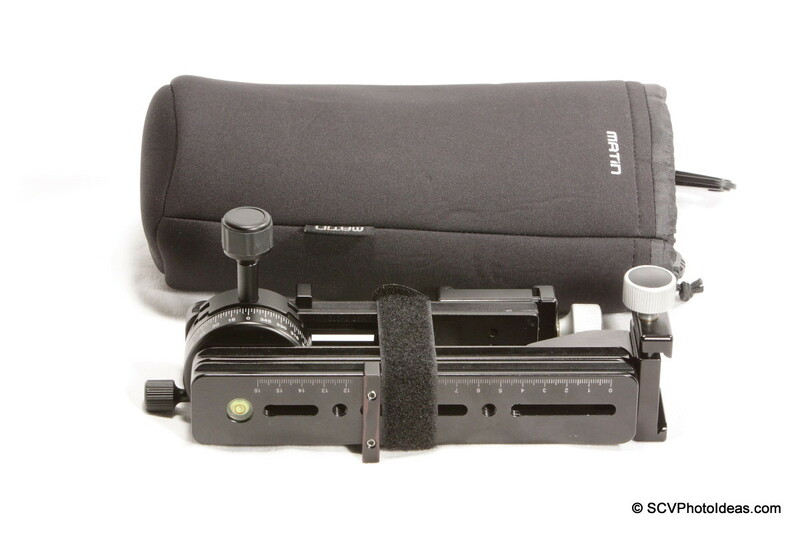 ...and a smaller bag, like the Matin S neoprene bag, to fit the PC-1 Panorama clamp. 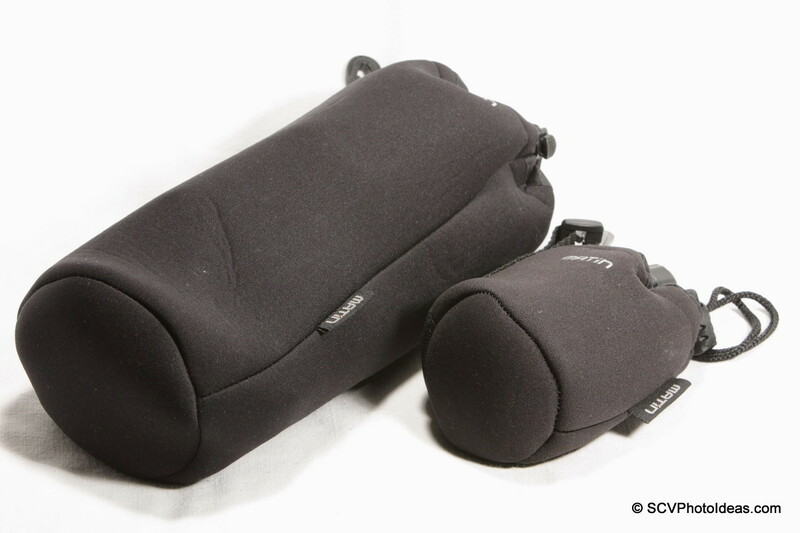 These soft drawstring bags are flexible and can fit easily in any big camera bag or back pack without fear of scratching other gear. 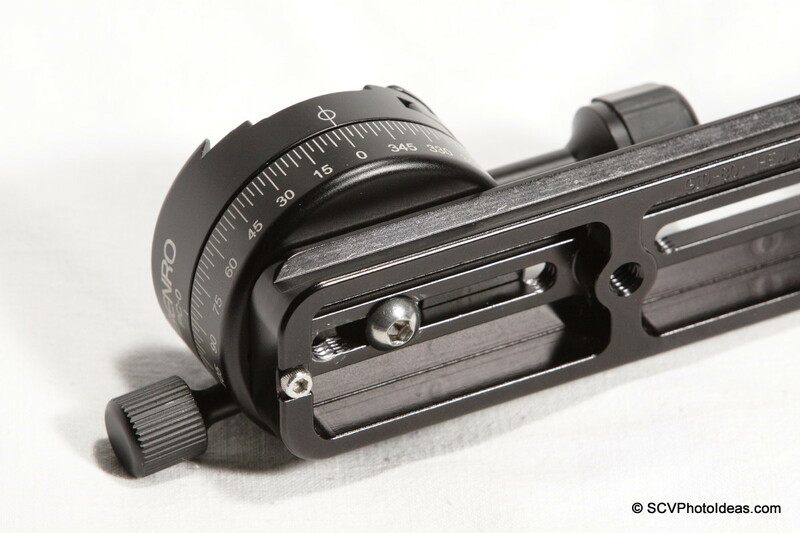 The New Hejnar Photo G103 -90 degree- Block Update has been released. 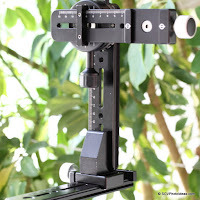 As of April 2012 all the Hejnar PHOTO 1/2" rails have a minor but very useful update. Decimal scales engraved on both top sides, at full length. 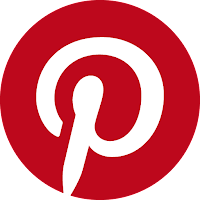 I hope you found this article and ideas useful, thank you for viewing. Current price of the Hejnar Photo Multi Row Panorama Rail Set is US $ 250.00 (+ shipping where applicable). The S.C.V. 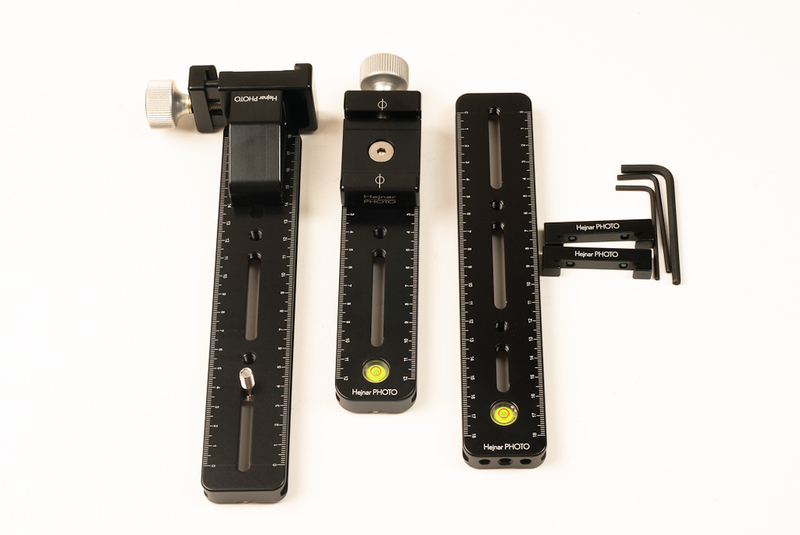 Panorama Package with 6" nodal slide as well as an S.C.V. 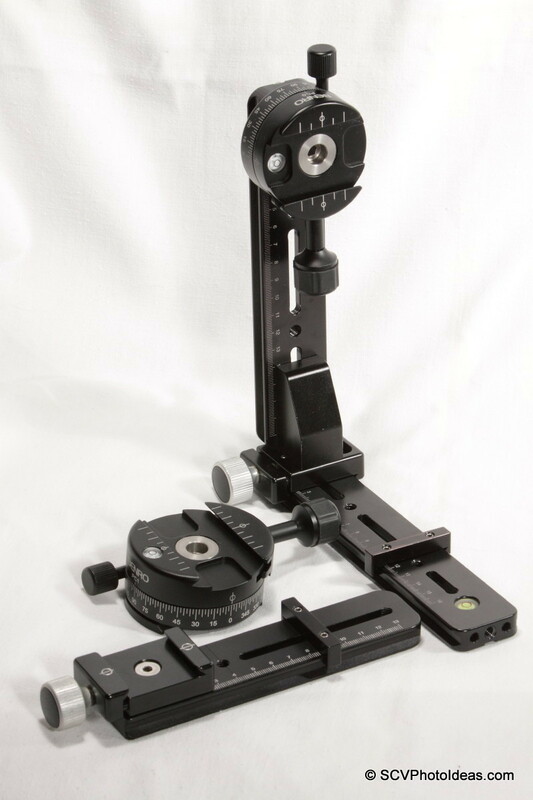 Panorama Package with 8" nodal slide are available direct from the Hejnar PHOTO online Store containing the latest version of all the products. Updated S.C.V. 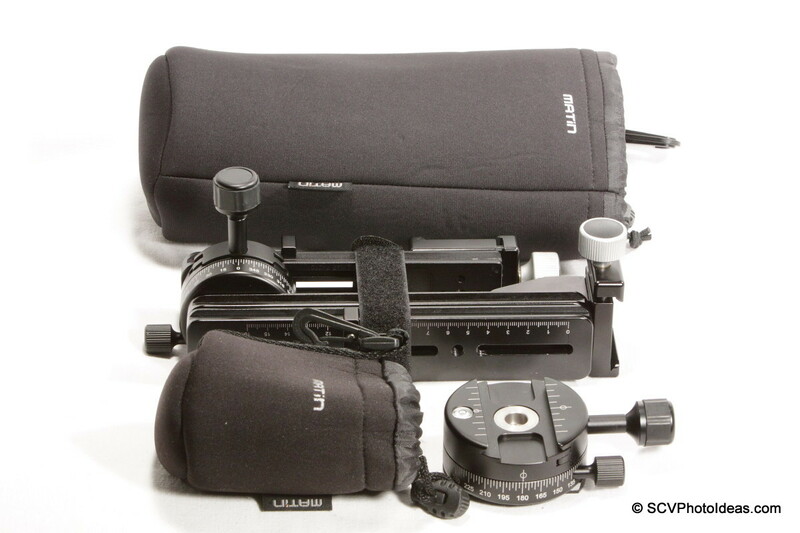 Panorama Package with 6" Nodal Slide (Photo by courtesy of Hejnar PHOTO ©Chris Hejnar). Before any purchase from the Hejnar online store, do check the Recommended Sellers page for the current valid Hejnar Photo discount coupon. I just wanted to say THANK YOU! The effort and detail you provided is astonishing! Very easy to understand and informative. Can't believe there aren't more comments thanking you for your efforts! Hi, Thanks for the great guide. 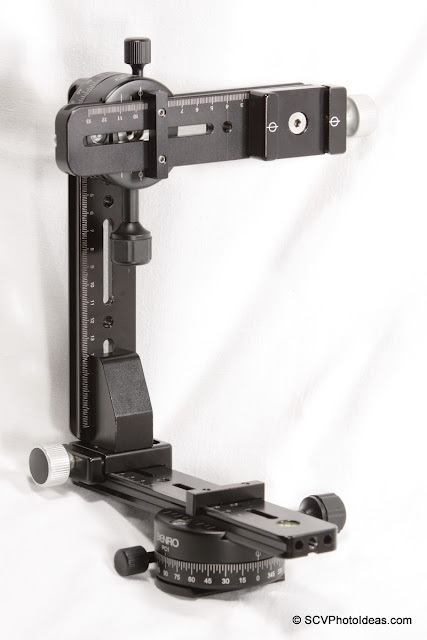 I'm just curious as to why you have the panorama head on which the whole rig is mounted, why not just have it mounted directly onto a standard clamp and then rotate the ball head? You might do that but not all ball heads have proper independent panning bases, while you'd need to level the tripod precisely which is more difficult. Please refer to the article Using Multi Row Panorama Head Ver II as mentioned above. There you'll see how a ball head is used to level the whole panorama rig. Alternatively the ball head may be replaced by a Leveling Base. 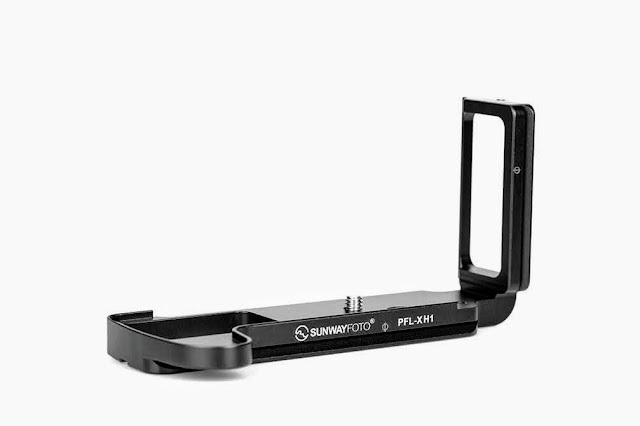 The load capacity of the rig is quite determined by the upper (vertical rotator) which holds the load at an offset position due to the NPP (non parallax point) of the lens. 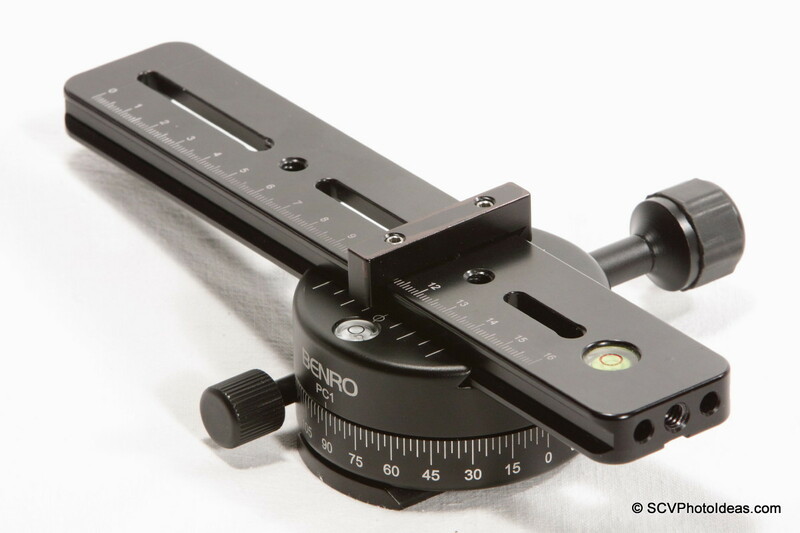 In the case of the Benro PC-1 described here, it can withstand a max torque of ~3.9 Kg at a distance of 12 cm from the pivoting point as documented and illustrated in the Benro PC-0 and PC-1 Panorama Clamps review. The load increases as closer to the pivoting point we get. 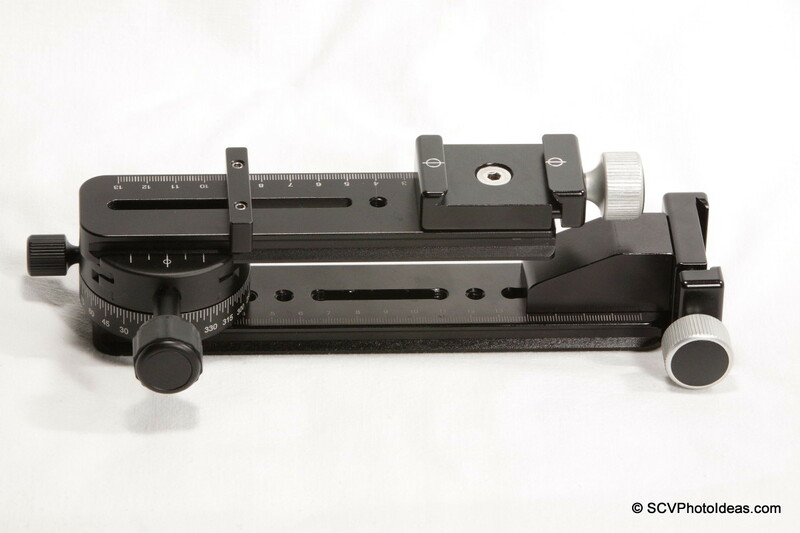 If you need something stronger then you can have a look in my article Create a Heavy Duty Multi-Row Panorama Head where the upper indexed rotator can withstand ~19 Kg !!! at an offset of 12 cm. Another view of the mysterious turquoise blended waters of Myrtos bay in great contrast to the steep cliffs and the clouded sky.